Stephen and I have worked with many designers, consultants, project managers and architects – professionals who act on behalf of their client, so all our work is channeled through them. Always the most important things are: a clear brief and clear authority. And this applies just as much when professionals go between us and our clients, as when we meet our clients face-to-face in Villefranche-sur-Mer, the City, or Morges. A clear brief and clear authority: with that, we can do our work. 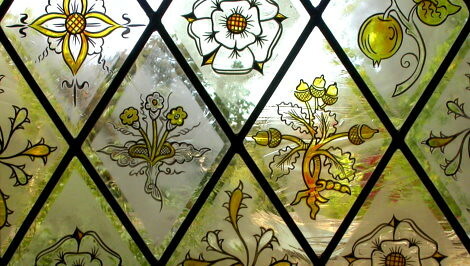 Here, our commission was to design and make two pairs of diamond windows, one set of which you can see here. This window covers the whole face of a modern extension to a Victorian coach house: it comprises nine sections, covering 14 square yards in total (more here). 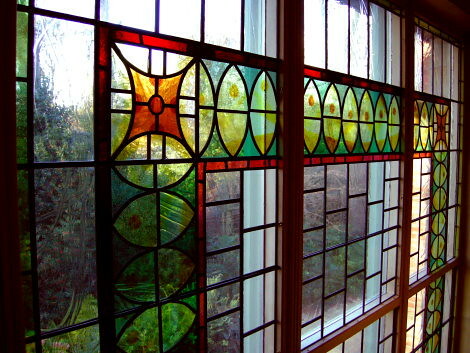 I must also mention the extraordinary refurbishment of a house on the edge of Hampstead Heath, where the designer-architect known as Misti commissioned us to make a set of 16 stained glass skylights for her client. A medieval bestiary, and – the virtues. See a finished stained glass beast right here. My point: face-to-face with you, or through your interior designer, consultant or architect – once we have a brief and clear authority, then we can do what you want us to. Write to me here.